Draws on the well-known therapy of oral chelation (EDTA and malic acid). Contains magnesium which optimises cardiac muscle health and function. Contains garlic standardised in allicin, recognised for preventing age-related vascular problems (atherosclerosis). Contains bromelain, an exceptional anti-inflammatory enzyme. Cardio Clear is a remarkable formulation that draws on chelation, a medical procedure designed to eliminate harmful metals from the body. Enriched with magnesium, allicin and bromelain, it tackles all aspects of the physiopathological mechanisms involved in the development of cardiovascular disease. It combines well with Tensix, a benchmark supplement for lowering cardiovascular risk. What is oral chelation therapy? Chelation is a medical procedure designed to eliminate harmful metals from the body by means of a chelating agent. This agent binds to electrically-charged minerals or metals, such as iron, lead, copper and calcium, to form a stable, non-toxic complex which is easily eliminated via urine. increased production of nitric oxide. Oral chelation therapy is growing in popularity: in the United States, almost 110,000 people a year use it in a preventive capacity (5) and this figure looks set to grow. A large-scale study carried out over the last few years identified a reduction of almost 20% in cardiovascular events among at-risk individuals (6-7) who underwent this procedure. Note: though safe, EDTA is not recommended for people suffering from kidney failure, coagulopathy, or cirrhosis of the liver, or those taking anticoagulants. Who is Cardio Clear aimed at? Cardio Clear is for anyone at risk of cardiovascular problems. those exposed to road traffic pollution. What is in Cardio Clear? Cardio Clear contains two chelating agents, the previously-mentioned EDTA, and malic acid, a compound with a pleasant taste, found abundantly in plant life, and naturally present in apples, pears and grapes. It also contains other natural compounds widely-studied for their anti-atherogenic properties. Bromelain is a collective term for the proteolytic enzymes (those able to break down proteins into shorter fragments) present in the stem, fruit and leaves of the Bromeliaceae family of plants, which includes the pineapple. Approved and clinically used in Asia for reducing inflammation (9), studies have also identified its benefits for the cardiovascular system (10). Unlike other enzymes, bromelain is not broken down by the digestive system: this means it can enter the bloodstream and thus exert a systemic effect. It induces an increase in fibrinolysis (11), a complex physiological process which dissolves fibrin blood clots and prevents the formation of thromboses. It restricts the coagulation process (12-13). It reduces levels of prostaglandins which contribute to inflammation. Bromelain is therefore of significant interest since it acts on three complementary targets connected with the development of cardiovascular disease processes. The extent of its enzymatic activity is indicated in the composition of Cardio Clear: it’s expressed in GDU (gelatine-digesting units) per gram. A mineral essential for cardiac function, magnesium has been conclusively shown to help reduce blood pressure. Clinical studies suggest that administration of magnesium supplements has anti-thrombotic effects (14) and helps prevent atherosclerosis (15). Epidemiological research has shown that the lower the level of magnesium in the blood (hypomagnesemia), the greater the risk of suffering from cardiovascular problems (16-17). US medical authorities actually recommend increasing magnesium intake to prevent and treat hypertension. Indeed many experts have commented that the low cost and excellent safety of magnesium supplements means they should be recommended for those at risk of cardiovascular disease. Cardio Clear provides magnesium malate which offers very high availability and solubility. This is important because where magnesium is concerned, it’s not quantity that counts but quality: inferior forms will not be properly absorbed by the body, potentially causing some unpleasant symptoms (such as osmotic diarrhoea) and significantly reducing its benefits. Garlic extract standardised in allicin. Research has shown that garlic supplements may be beneficial for moderate hypertension due to its multiple effects on all the risk factors for cardiovascular disease. This property was highlighted in hypertensive subjects in two meta-analyses (18-19). Its use is also recognised by the World Health Organization for preventing age-related vascular problems (atherosclerosis). However, you would need to consume huge quantities of garlic to benefit from this property which is, of course, difficult. That’s why supplementation is so appropriate, particularly since the garlic in Cardio Clear is standardised in allicin, the component primarily responsible for garlic’s therapeutic effects. Parsley extract (in a 1:10 ratio, ie, 10g of parsley to 1g of extract). Parsley contains two particularly beneficial antioxidants: apigenin and lutein. These reduce oxidative damage in the body which helps delay the development of cardiovascular disease. However, it is also included in the composition of Cardio Clear for another, quite different property: in forming specific enzymes, it is able to capture sulphur-containing compounds in the mouth and gut produced by garlic consumption. Cardio Clear thus has none of the unpleasantness of many garlic extract supplements (20) . The use of oral chelation to prevent cardiovascular disease is expanding rapidly: in just 20 years, it has grown by more than 70%. It is particularly difficult to obtain bromelain without taking supplements: it is ‘processed out’ of products such as canned pineapples and commercial pineapple juice (21). The typical Western diet provides barely 50% of recommended daily intake for magnesium, which is 420mg for men and 320mg for women (22). Cardiovascular disease is the leading cause of death among Western populations. As these diseases are highly complex, it’s important to attack them on all fronts. This is exactly what Cardio Clear does, with its diverse ingredients and modes of action. Cardio Booster, a formulation that combines the most widely-studied substances for cardiac muscle function. Nitric Oxide Formula, another specialist formulation for circulation problems. PADMA Basic, a phyto-nutritional supplement based on a traditional Tibetan formulation. Sytrinol™ 150 mg, a natural alternative for combatting hypercholesterolaemia. TMG (Trimethylglycine) 750mg, a natural compound involved in the methylation cycle. Triple Protect, a formulation for fighting atherosclerosis. 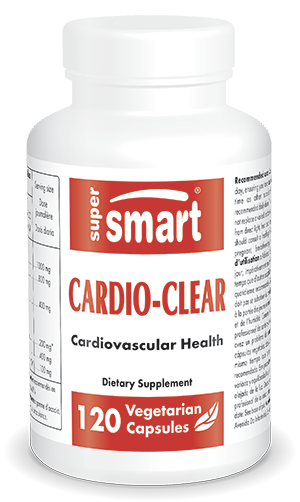 Cardio Clear is an alternative formulation aimed at improving cardiovascular problems. It is based on oral chelation, a procedure supported by theAmerican College for Advancement in Medicine, and incorporates a number of ingredients widely-studied for their benefits on circulation. This product should not be used as a substitute for a varied, balanced diet and a healthy lifestyle. It’s important to follow the guidelines on how to take it and the recommended dose, and to use it by the ‘best before’ date. It is not recommended for women who are pregnant or breastfeeding, or for children under 15. Keep out of children’s reach. Store in a cool, dry place. Other ingredients : microcrystalline cellulose, magnesium stearate, silicon dioxide. Adults. Take two vegetarian capsules, twice a day. They must be taken in between, not with, meals. Do not take at the same time as other supplements.